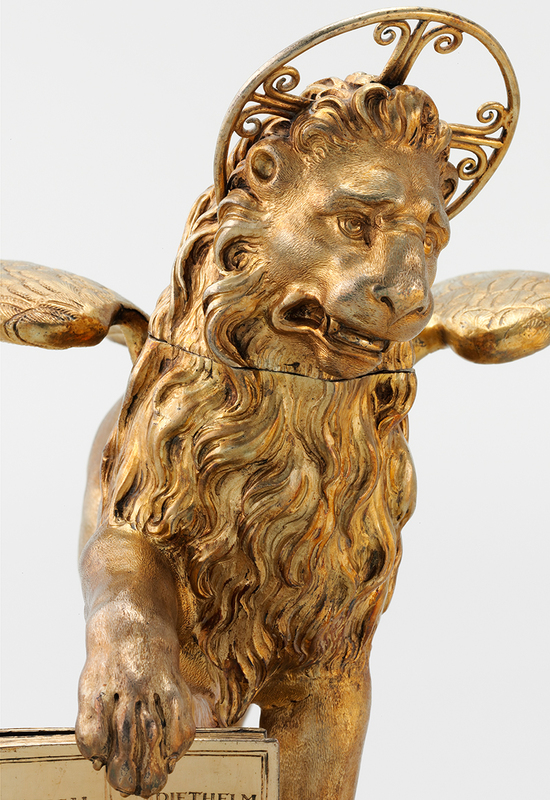 The Zurich winged lion of St Mark dates from 1608 and is 31.5 cm high. The lion of St Mark was the symbol of the Venetian Republic. But Zurich also has a lion of St Mark. It dates from the 17th century and is contemporary witness to a bygone alliance of cities. Zurich – Bern – Venice. What sounds like an Interrail route was already a known grouping as early as the 17th century. However, it was not as a journey, but as a coalition: in 1615, these three cities entered into an alliance. For the Venetians, the main purpose was to secure the direct trade routes to the north and to France. Those routes were threatened by the presence of the Spanish in northern Italy. The agreement gave Venice the right to recruit one regiment from Zurich and one from Bern if necessary. Since the late Middle Ages, Swiss soldiers had been regarded as fearsome fighters on the battlefields of Europe, and were highly sought-after. In return, the two Swiss cities secured for themselves trade freedoms, from which the Zurich textile industry in particular benefitted. Drinking vessel in the shape of the Venetian lion of St Mark.